This is the thirtieth in a series of posts about war tax resistance as it was reported in back issues of Gospel Herald , journal of the (Old) Mennonite Church. 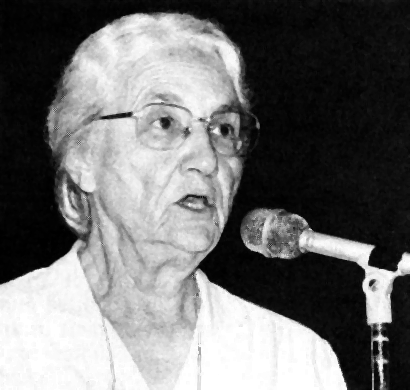 In 1989 the Mennonite Church General Assembly would hold a long-overdue vote on whether or not to support war tax resistance as an institution. You’ll have to scroll down to see how that turned out. A Japanese court has ruled against 22 military tax resisters, including Mennonite pastor Michio Ohno. The ruling by the Tokyo District Court came recently after nearly eight years of litigation. The case had its origin after the bank accounts of Ohno and another person were attached by the government because they didn’t pay their taxes. For reasons of conscience, the 22 object to paying the portion of their taxes that is used for military purposes. The negative ruling does not discourage them, however. “We believe it is this type of lawsuit which, repeated a thousand times, will open the way to legalize conscientious objection to military taxation in Japan,” said Ohno. Krabill felt that war tax resisters were twisting themselves in knots trying to explain away scriptural passages that on their clear facial reading counseled taxpaying. Peachey explained why she thought war tax resistance was worth taking seriously (this is the same commentary as appeared in The Mennonite and that I excerpted here). Moyer thought that anti-abortion protesters ought to be war tax resisters as well. Nafziger thought that Krabill wasn’t discerning the clear obvious meaning of the bible so much as offering a distorted version of it in order to justify paying war taxes. General Assembly actions in recent years have repeatedly affirmed tax resistance, based on Christian conscience, as a valid part of our peace witness. We see these actions not as liberal trends but rather a needed return to New Testament teachings: to the life, nonviolent teachings, and spirit of Jesus and to Anabaptist understandings of church and state separation, roles, and loyalties. Today military technologies are more important than personnel and therefore the drafting of our dollars for war and preparation for war is a crucial matter. The central issue in the earlier General Board recommendation, in my perspective, was not tax resistance per se but whether the Mennonite Church is ready to respect and support the consciences of those who request that their taxes for military purposes not be withheld. Recently, a young man named Jose was returning to his house in the Philippines. Government soldiers, who later claimed Jose was out after curfew, shot this defenseless youth, leaving him with a serious leg injury. They refused him treatment for enough days that gangrene claimed his lower leg. When we finally met Jose in the hospital, the lad needed to find blood for his leg amputation. Weekly, in our work with Mennonite Central Committee, we hear stories of global brothers and sisters who are being maimed or killed with weapons of war, many of them supplied by the American government. Therefore, when we are faced with the turning over of our income to the Internal Revenue Service for supplying these coffers of war, it feels to us that to do so willingly would be the equivalent of signing the death warrant for innocent friends. We do not expect that everyone in the Mennonite Church will share these deep convictions of ours. We believe that many Mennonites have wrestled with this issue in honesty and prayer and have come to different conclusions from our own. Still, we are very saddened when we learn in Gospel Herald that Mennonite Church General Board chose to back away from recommending to General Assembly that the convictions of church institutional employees who object to paying military taxes shall be honored by their employers. The action leaves us feeling lonely. What is the church telling us? Are our convictions out of place in our church? Are we considered stubborn people who refuse to see the truth that the church identifies? Is the church asking us to give up these deeply held convictions? We don’t know. We sincerely value the counsel of the church community. And yet somehow we can’t seem to shut off our (misguided?) consciences on this matter. Linda Peachey in “Agonizing Over War Taxes”… makes a good argument for withholding war taxes. However, there is another angle from which to view the issue of not paying war taxes. The primary Scripture cited in the debate is Matthew 22:15–22 (and parallels). If we would apply a little historical and political exegesis to this passage, we would have to ask ourselves how we could apply Jesus’ response to ourselves. For instance, we are not a nation or a people held captive under a foreign ruler, such as Palestine was during the time of the Roman Empire. Also, we are not presently ruled by a monarch; we realistically have no “caesar” over us. If there is a caesar, so to speak, then we are caesar. In our form of democracy, we have no absolute authority set over us. What we do have is public servants set under us. We, as responsible citizens, are the authority of this nation. If our nation blunders and falls, the blame is on us, not merely on those whom we have elected. We do not all agree on the question of nonpayment of taxes for military purposes… But shouldn’t we all be asking whether an agency of our church should withhold taxes for employees who have a conscience against payment of the military portion? Should a peace church agency side with the state against the conscience of its own members? And is that consistent when the church is on record supporting the conscientious action of its members in nonpayment? It would seem appropriate for us to arrive at a plan whereby the request of employees be respected and taxes for military purposes not be withheld by church agencies. We’ve known since childhood the stories of God’s people in the Old and New Testaments who said to government and religious authorities, “I can’t do that,” or “You can’t do that,” or “We can’t do that,” and then took the awful consequences. Will we rouse from our easy “Christianity” and recognize when the time has come for us to say such words — to obey God rather than man and take the consequences? As for the recommendation on military tax withholding, the board concluded after consulting the district conferences that the recommendation had to be rewritten. The sequence of events was as follows. At Purdue 87 , General Board was asked by General Assembly to consult the church on the question of the conscientious objection to the payment of military taxes, particularly the withholding of such taxes by church institutions for persons who objected to paying them. 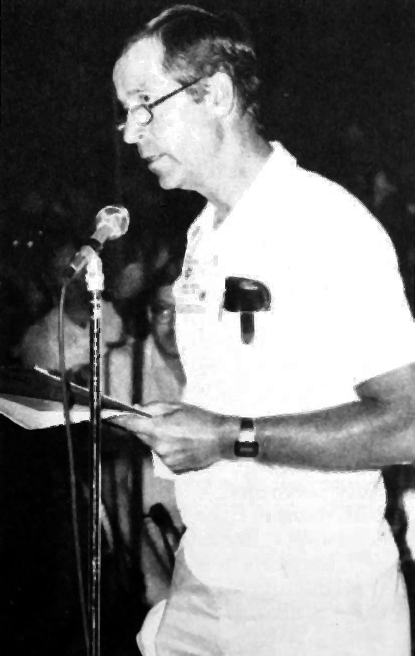 In April 1988 , General Board approved a statement for presentation to General Assembly at Normal 89 which included the recommendation that the convictions of church institutional employees who object to paying military taxes shall be honored by their employers. Accordingly the board saw it as necessary to prepare a drastically revised proposal. Gone from this proposal was any reference to illegal action such as a church institution refusing to collect military taxes from those conscientiously opposed to paying them. Instead the statement which is to appear in the “workbook” prepared for General Assembly delegates calls for “study of the church/state issues raised by the collection of taxes by church agencies” and for support of the Peace Tax Fund options being called for in both the U.S. and Canada. Military taxes for church employees is a particularly difficult subject. This issue has been knocking around for several years already. As I reported on May 2 , the General Board at its last meeting passed a much less decisive proposal than expected. This revision was made after consultations with district conferences. If anyone wishes to press for the church to take a radical position on this issue, it will be necessary to make that point clear since the General Board received mixed signals in consultations with the conferences. The Mennonite Church General Board held a one-day meeting on July 31 prior to Normal 89 . No major issues were resolved in this brief meeting. Much of the activity involved receiving reports and doing final work on statements to be presented to General Assembly. Among the reports being prepared for the assembly was one related to the payment of war taxes. This followed an action of Purdue 87 which had called for the board to study this issue and report to Normal 89 . There had been a change of stance from April 1988 to April 1989 after consultation with the district conferences. In April 1988 , the board had drafted a proposal which included a recommendation to respect the consciences of employees of church organizations who do not wish to have the military portion of their income tax deducted from their paychecks. By April 1989 this proposal was withdrawn and the emphasis was rather on study of the issue and support of the Peace Tax Fund. On July 31 , the board made final revisions on this statement for presentation to Normal 89 . The conference delegations caucused several times during the debate about war-tax resistance. Here Dave Miller makes a point to his fellow delegates from Indiana-Michigan Conference. 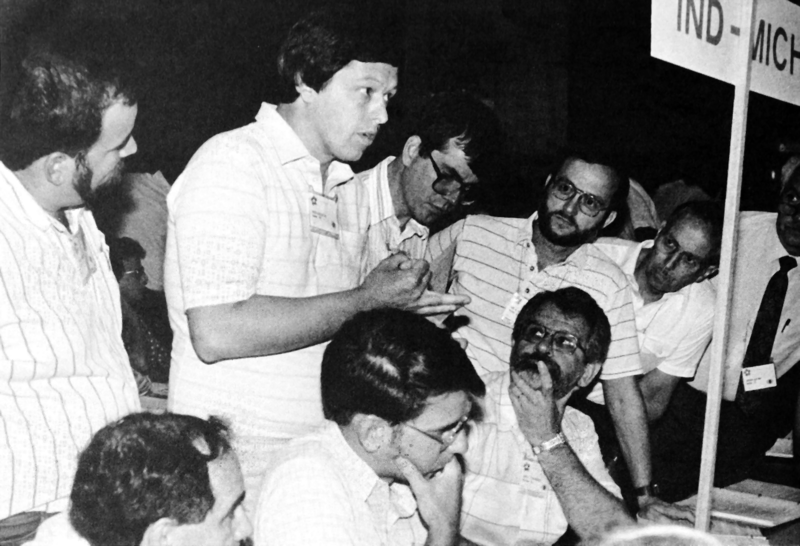 Merger with a sister denomination and illegal support for war-tax resisters became a distinct possibility following two crucial secret-ballot votes by the Mennonite Church General Assembly delegates during Normal 89 . The merger vote was decisive — 86 percent — and there were no surprises. But the tax vote was close — 59 percent — and was the result of an unexpected turnaround on the General Assembly floor. Ruth Brunk Stoltzfus of Virginia Conference calls for more courage instead of more study on the matter of tax-withholding. The war-tax issue proved to be a much thornier and more complex matter. It all started about 10 years ago when employees of Men­non­ite Church agencies and schools began re­quest­ing that taxes not be with­held from their pay­checks so they could refuse to pay the portion of their federal income taxes (about half) that is used by the U.S. gov­ern­ment for mil­i­tary purposes. The em­ploy­ees said they are con­sci­entious ob­jectors to mil­i­tary taxes in the same way their fathers and grand­fathers were con­sci­entious ob­jectors to mil­i­tary service in times of con­scription. The agencies and schools would break the law if they honored their employees’ request. Caught between their employees’ consciences and the government’s requirements, the agencies and schools appealed to General Board for help. What followed was years of study and discussion. Finally, in April 1988 , General Board members voted to recommend to General Assembly that church agencies and schools be permitted to honor the requests of employees who want to resist war taxes. The General Board action then went to district conferences for their response. The response was mixed and generally cautious, so General Board watered down the recommendation at its April 1989 meeting. By the time of its meeting the day before the start of Normal 89 , however, General Board put some teeth back into the document, but it was still a weakened form of the original version. When General Assembly took up the issue, several delegates jumped up to scold General Board for its indecisiveness. “General Board has backed off on this issue, and that makes me sad and angry,” said Bob Hartzler of Allegheny Conference. “General Board must exercise leadership on this and not just gather consensus.” He then asked that the original recommendation be restored. After more debate and two time-outs for district conference caucuses, the delegates agreed to vote separately on the three sections of the revised recommendation and then on the “heart” of the original version, as requested by Hartzler. The three sections were approved by unanimous or near-unanimous hand votes. The revised document calls for (1) further study of the war-tax issue, (2) financial and other support for the peace-tax fund options being proposed in the U.S. Congress and the Canadian Parliament, and (3) moral and financial support for war-tax resisters. Action on the heart of the original version, giving agencies and schools permission to not withhold taxes when requested, was tabled until later in the week. When the issue came up again, GC general secretary Vern Preheim was present to report on his denomination’s experience since it took a similar action in 1983 . Though the U.S. Internal Revenue Service contacted the GC leaders early on to confirm the action and warn them about the consequences, to date IRS has not moved against the GC Church. The district conferences then caucused, and when debate resumed, many of the speakers reported on the general feelings of their conference delegations. “We stand in a long line of saints who have faced decisions like this, starting with the women who illegally hid baby Moses,” said Weldon Nisly of Ohio Conference. Del Glick of Indiana-Michigan Conference reported that several people in his delegation had changed their minds and were now prepared to vote yes. “We want to take a stand,” he said. “It will probably take more courage to face our congregations than to face the government!” Brent Foster then announced the support of Afro-American Mennonite Association. Ron Schertz, a lawyer who is a board member of Mennonite Board of Missions, offered one of the few opposing comments. He warned that approval of the document would get in the way of MBM’s main mission and jeopardize its tax-exempt status. Robert Hartzler of Allegheny Conference introduces an amendment that put teeth back into the war-tax recommendation. Another major agenda item for General Board was follow-up work on the military tax action by General Assembly at Normal 89 in August . After years of study and debate, the General Assembly delegates voted to permit denominational agencies and schools to honor — illegally — the request of employees who, for conscience’ sake, don’t want taxes withheld from their paychecks. This is so they can refuse to pay the portion that is used for the military. The General Assembly vote was close (59 percent) and no employees are currently requesting non-withholding, so the General Board members agreed to proceed with caution. But they also agreed that regardless of what the agencies and schools do and regardless of whether General Board itself has employees who request non-withholding, they would take a clear stand on military taxes and submit another recommendation to the next General Assembly sessions in 1991 . Meanwhile, General Board will plan a major consultation on military taxes for May and prepare a study guide to be ready by then. Conferences and congregations will then be encouraged to study the issue and report to General Board. Voluntown, Conn. (LNS) — Twenty cyclists, calling themselves Project Roll, started out September 27 on a 1200-mile caravan to promote a nationwide resistance to taxes used for military purposes. Traveling throughout New England and Eastern New York State, the peddlers — students, Vietnam veterans, and peace workers — plan to picket several military installations, and to speak at meetings, rallies, and TV and radio talk-shows along the way. In addition, the group will provide a focus for alternate use of withheld tax money in the form of “Funds for Life” which are oriented toward community needs. The trip is scheduled to wind up at Andover Mass. on November 24 for a celebration of “Life Giving Day — A Day of War Tax Resistance” which will include a rally and other actions at the Internal Revenue Service regional headquarters there.